The Dollar Index has rallied for three weeks without a significant correction, raising the odds that April’s 89.23 low could turn out to be a very important one. Notice as well that the dollar’s romp has exceeded numerous prior peaks, including no fewer than one ‘internal’ and two ‘externals’ labeled in the chart. From a ‘Hidden Pivot’ perspective, this defines the rally as a powerful ‘impulse leg’ — i.e., one with the presumptive moxie to generate another once the inevitable correction has run its course. The technical implications would be even more significant if buyers are able to push this vehicle past yet another ‘external’ peak without correcting along the way. 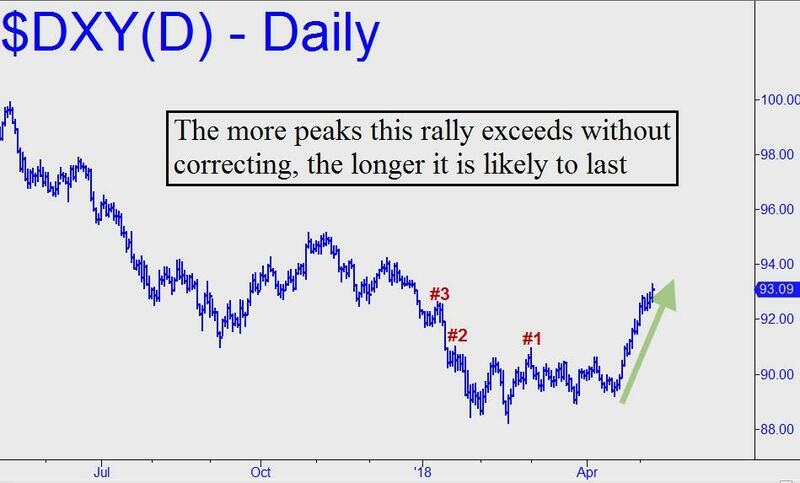 The number to watch is 94.22, where DXY apexed in December. If you don’t subscribe but want to join in the fun, click here for a two-week free trial to Rick’s Picks, including access to a 24/7 chat room that draws great traders from around the world.